In January of 1945, my father-in-law, Marlet Goodwin, enlisted in the Merchant Marines and spent two years working in the "belly of the beast" in the engine rooms of the ships on which he sailed. He recently passed on to me some of the training manuals that he received while in the Merchant Marines and later while in the Naval Reserves. Some of the information contained in those manuals are amazingly detailed - both for mechanical and electrical systems. Since the basics have not changed much over the past 70 years, I thought it might be useful to make some of the content available here. Government publications are considered to be in the public domain, and may be freely redistributed so long as credit is given*. Accordingly, I have undertaken the task of scanning and publishing the content of the Electricity basics course here. Other manuals will be added as time permits. The time consumed in doing so is extensive. Each page was scanned once to do an optical character recognition (OCR) processing on it, and then again to obtain the images (OCR tries to interpret images as text and makes a real mess there). Although anyone may freely copy a government publication, no one may copy my version of the publication of it. If you want to publish content from the manuals, you must scan your own images and create your own duplicate text. However, I welcome anyone to print out these complete pages for use in self-study, or even as part of a classroom course - just be sure to give proper credit. Here is the "Electricity - Basic Navy Training Courses" (NAVPERS 10622) in its entirety (or will be eventually). It should provide one of the Internet's best resources for people seeking a basic electricity course - complete with examples worked out (links to quizzes at end of chapters). 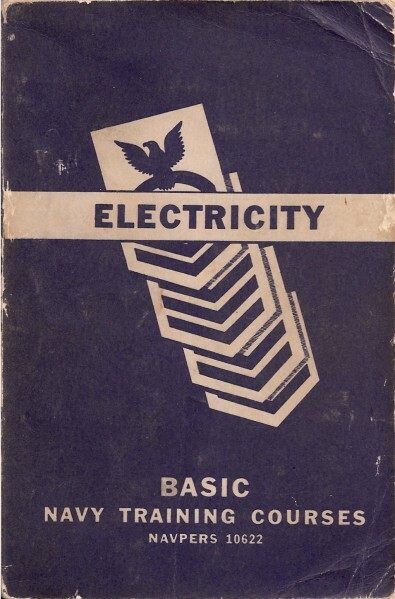 This book is intended as a basic reference for all enlisted men of the Navy whose duties require them to have a knowledge of the fundamentals of electricity. Such a knowledge is of especial importance to those men in the Seamen Branch, Artificer Branch, and Engine Room Force who are responsible for the operation, maintenance, and repair of electrical equipment. Whether the job involves work on fire control apparatus, radios, steering gear, or motors and generators, the technician should be thoroughly familiar with the basic theory underlying the operation of the mechanism. Beginning with a broad picture of the electrical constituents of matter, the book proceeds with a discussion of static electricity, electricity in motion, and electrical circuits. It explains the uses of Ohm's Law, and the Power Equation, and makes applications of formulas involving Kirchhoff’s Laws. Emphasis is placed on various types of circuits-series, parallel, and series-parallel-and on the theory of induction as applied to electrical apparatus. The essentials of generators and motors are fully explained. The closing chapters include discussions on vacuum tubes, transformers, and electrical measuring devices. 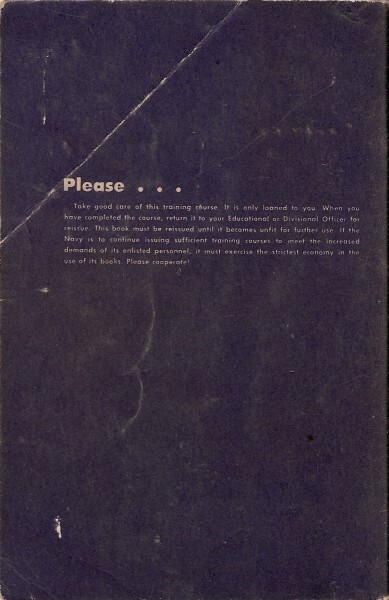 As one of several basic NAVY TRAINING COURSES, this book was prepared in the Training Courses Section, Standards and Curriculum Division, Training, Bureau of Naval Personnel. * Relevant excerpt from the www.cendi.gov website. 2.2.4 What is public domain? Public domain refers to works that are not protected by copyright and are publicly available. They may be used by anyone, anywhere, anytime without permission, license or royalty payment. A work may enter the public domain because the term of copyright protection has expired (see FAQ Section 2.1.6), because copyright has been abandoned, or in the U.S. because it is a U.S. Government work and there is no other statutory basis for the Government to restrict its access (see FAQ Section 3.1.5). A work is not in the public domain simply because it does not have a copyright notice. Additionally, the fact that a privately created work is, with permission, included in a U.S. Government work does not place the private work into the public domain. The user is responsible for determining whether a work is in the public domain.